Cast: Jack Black, Kyle Gass, Tim Robbins, Meat Loaf, Ben Stiller. Directed by Liam Lynch, written by Jack Black and Kyle Gass. Story: Birth of a rock band. Tenacious D: The Pick of Destiny is infectious - if you catch their bug you've just found a new classic. If you're immune, you'll be wondering what everyone else is guffawing at. If anyone's planning on remaking Bill and Ted's Excellent Adventure, they've been beaten to it - Tenacious D is so similar it oozes from every pore. That's no bad thing, Bill & Ted's was a classic and Tenacious D has a modern freshness, but honestly, the similarity is uncanny. Jack Black and Kyle Gass are the two loser "musicians" with an unshakable inner belief, and Jack Black in particular is born to play parts like these. With Nacho Libre's deadpan silly humour and a reckless disregard for the critics' opinions, its sheer energy and charisma is contagious and made me laugh repeatedly despite its simplistic and base roots. And the thing is, the more you watch it, the funnier it gets. There's nothing particularly good at all in the movie, when you analyse it - it has no right to be funny. Jack Black's feverish enthusiasm and manic monkeying do all the work. Sure, the script has some daftly amusing moments, but it'd be nothing without Jack. For this reason, you really have to "get" his humour to stand any chance of having a good time. Or you have to be stoned, that'd help - in fact, this will undoubtedly join the ranks of top stoner movies, along with that weed appreciaters' gem Dude, Where's My Car. The surprise appearance of Tim Robbins only helps with the mountingly surreal feel, and thankfully he's not given enough freedom to muck it up. Meat Loaf, however, could have been used far more, as his irreverent style goes down very well indeed. 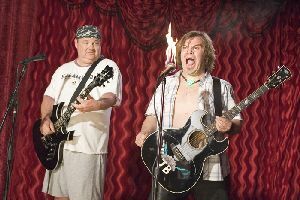 Tenacious D: The Pick of Destiny is definitely an acquired taste, but it's worth acquiring. Silly and fun, crude and brash, it's the perfect musical tonic to the glut of terrible Christmas movies. Testosterone Satisfaction Rating: 2/5 - loud rock music, profanity and recreational drug use. To enjoy this film you should be: amused by daftness, or high as a mountain goat. 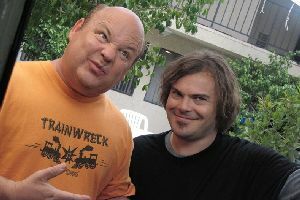 Tenacious D was released in the UK on 24th November.